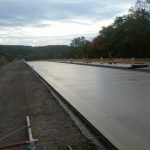 Scope of Project: This award winning project involved 4.1 miles of unbonded concrete overlay 24’ wide and reconstruction of shoulders and drainage. The entire roadway, traffic control, and E&S plans on this project were design build. Scope of Project: For the complete reconstruction of the SR70 and 31 interchange in Westmoreland County. The traffic control plans as part of this project are design build for all phases of work. Scope of Project: This project was a design build project that included replacement of Baldridge Bridge on Mission Road over Loyalhanna Creek with minor approach work, update signing and pavement markings, mind grouting, and other miscellaneous construction. 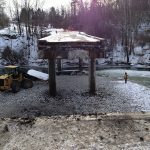 Scope of Project: The project included construction of a 600’ bridge over the Beaver, a 3 span railroad bridge, and a soldier pile retaining wall. The substructure for the 600’ bridge and the soldier pile retaining wall were design build.